"Me time" means coffee and cheesecake for me recently. As I've already tried Secret Recipe, I tried Coffee Bean this time. 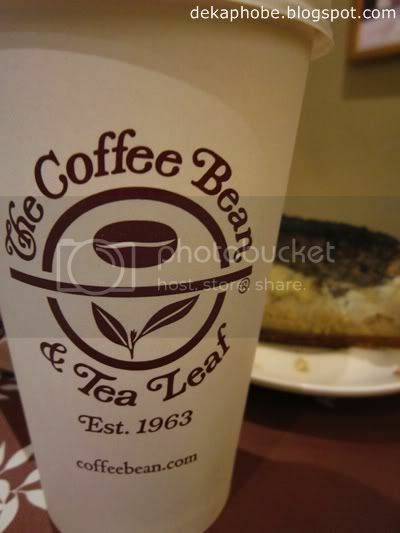 The Coffee Bean and Tea Leaf started almost a decade before Starbucks. If Starbucks is from Seattle, Coffee Bean is from California. There are several Coffee Bean branches around and outside the Metro, however, there are still have so much expansion to do to be at par with Starbucks. (My apologies if I have to compare it with Starbucks). I think this is more of a tea shop than a coffee shop, and I'm not really into tea (including milk tea). I ordered a large Hot Cafe Latte (Php 135) and a slice of Triple Decker Cheesecake (Php 135). For the unfamiliar with those coffee terms, a cafe latte is espresso added with milk. I found the coffee mild, but maybe I'm just used to strong coffee. 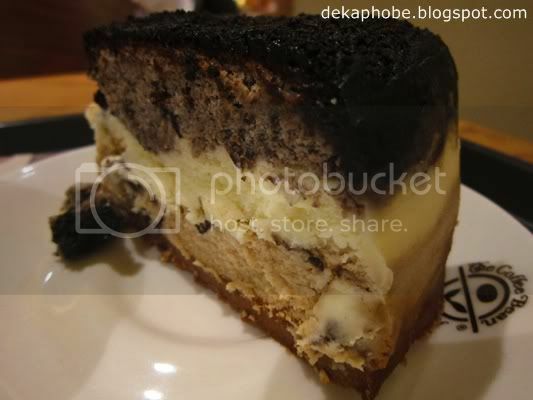 The Triple Decker Cheesecake are layers of coffee, oreo and Chicago cheesecake on almond cookie crust. This cheesecake is quite heavy and it's not too sweet, which I liked. It doesn't look appeticing though. I also got a slice of Chicago cheesecake (Php 125) for take-away. Chicago cheesecake is plain cream cheese with some lemon tartness on almond cookie crust. I love this cake! Again, it's not too sweet and I could pass my fork through it. This is quite childish but I love that it sticks to my palate. My cutie take away box! 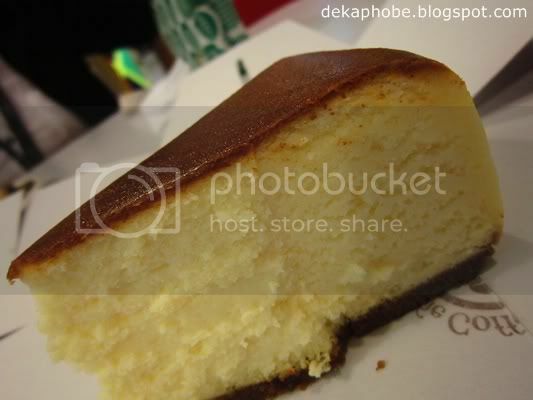 Overall, I'd think I'll go back to Coffee Bean for another generous slice of their cheesecake. haven't tried this place... willing but haven't found it yet here in Davao... thanks for sharing. Yahweh bless.